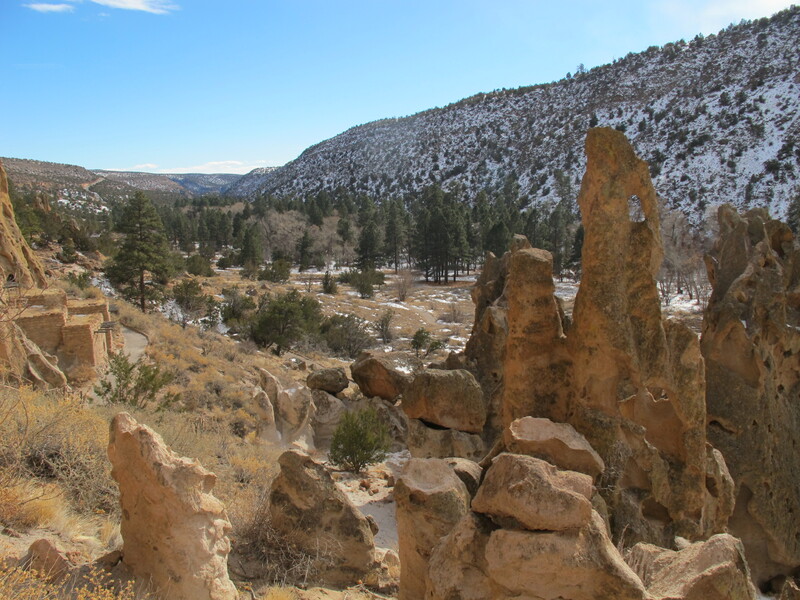 “It’s the grandest thing I ever saw!” exclaimed Adolph Francis Bandelier standing at the rim of New Mexico’s Frijoles Canyon in 1880. He was born in Bern, Switzerland but his family emigrated to Illinois when he was eight. Fascinated with the history and culture of American Indians in the Southwest, he became one of the foremost anthropologists and ethnologists of the Pueblo people. 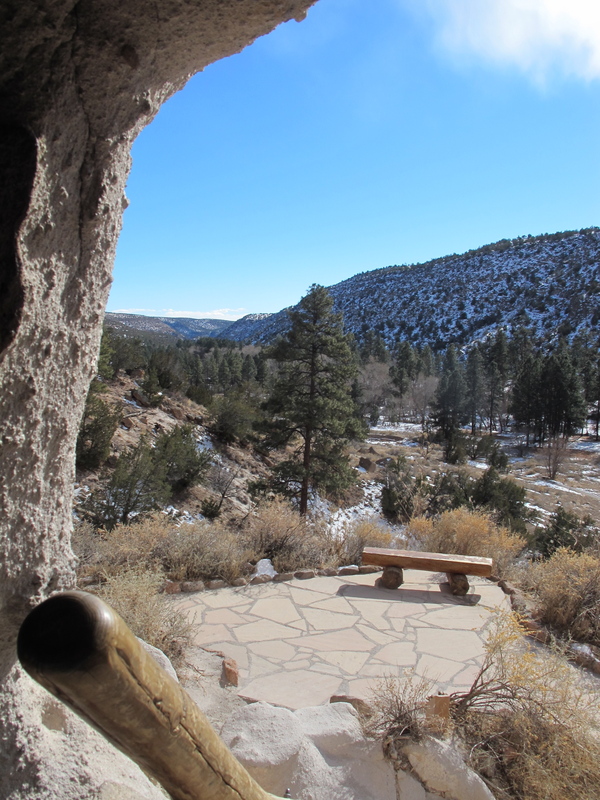 Today the Bandelier National Monument, named after him in 1916, remains a witness to the native people’s ancestral history on this land and a testimony of one man’s determination to bring that history to life. 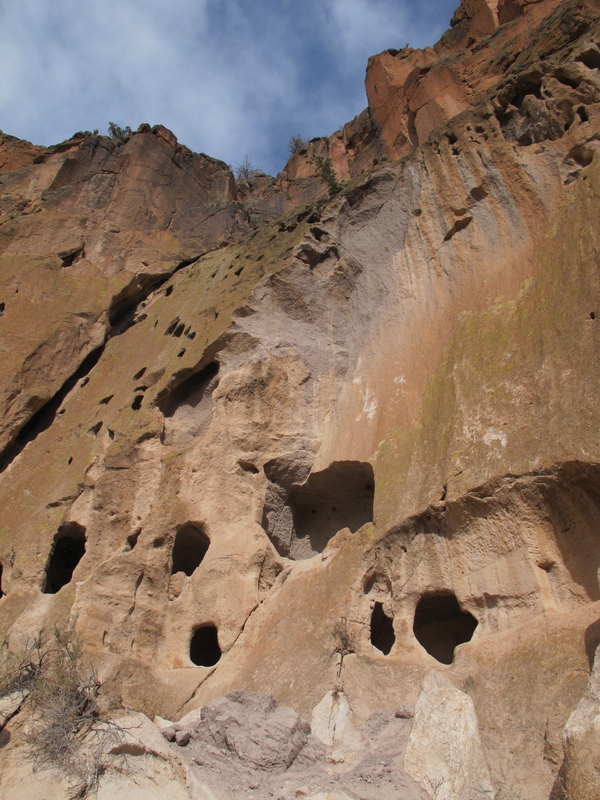 In 1890, Bandelier wrote novel titled The Delight Makers, a fictional tale in which he re-imagines the life of pre-Columbian Pueblo Indians. 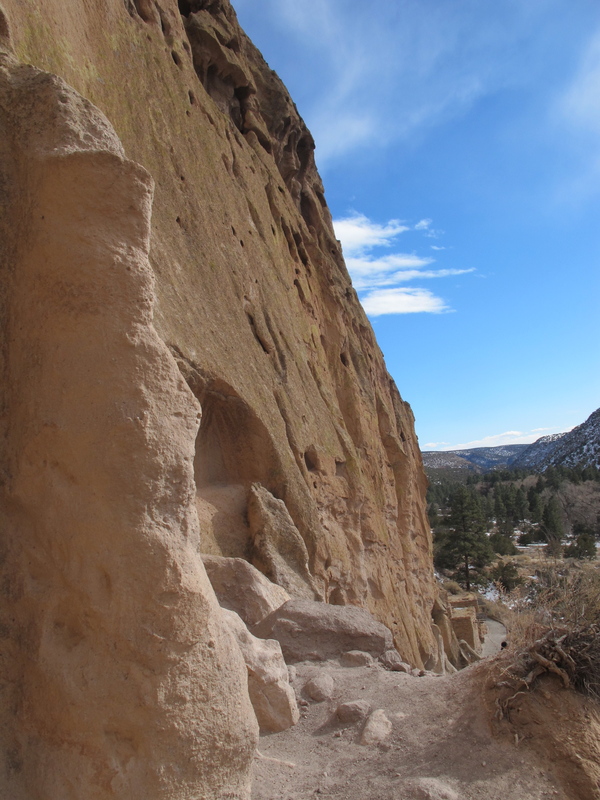 The novel opens with a description of the Frijoles Canyon as Bandelier saw it. Over a hundred years later that was exactly the view I was taking in on a cold January day and my reaction was the same – it’s the grandest thing I ever saw! 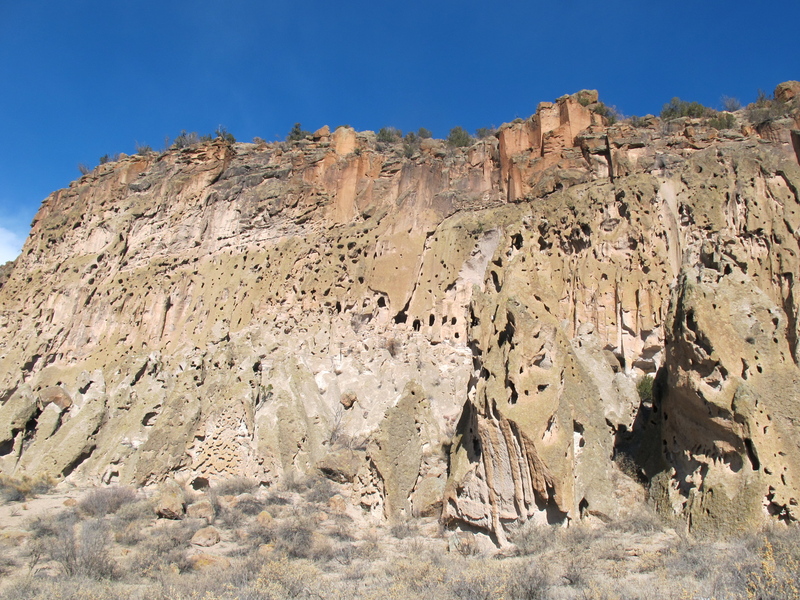 The entire formation of the chain, as far as it faces the Rio Grande, is volcanic, the walls of the gorges consisting generally of a friable white or yellowish tufa containing nodules of black, translucent obsidian. The rock is so soft that in many places it can be scooped out or detached with most primitive tools, or even with the fingers alone. Owing to this peculiarity the slopes exposed to the south and east, whence most of the heavy rains strike them, are invariably abrupt and often even perpendicular; whereas the opposite declivities, though steep, still afford room for scanty vegetation. 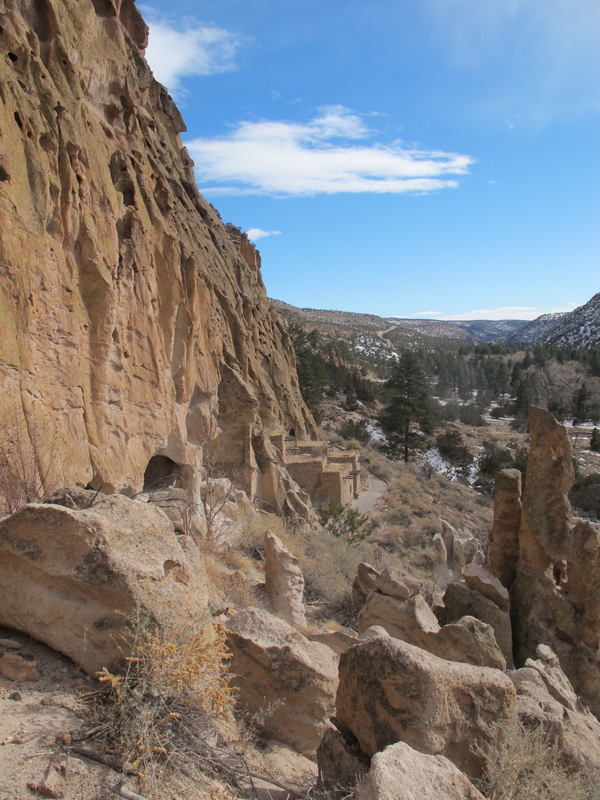 The history of human settlement at what is today Bandelier spans over 10,000 years. 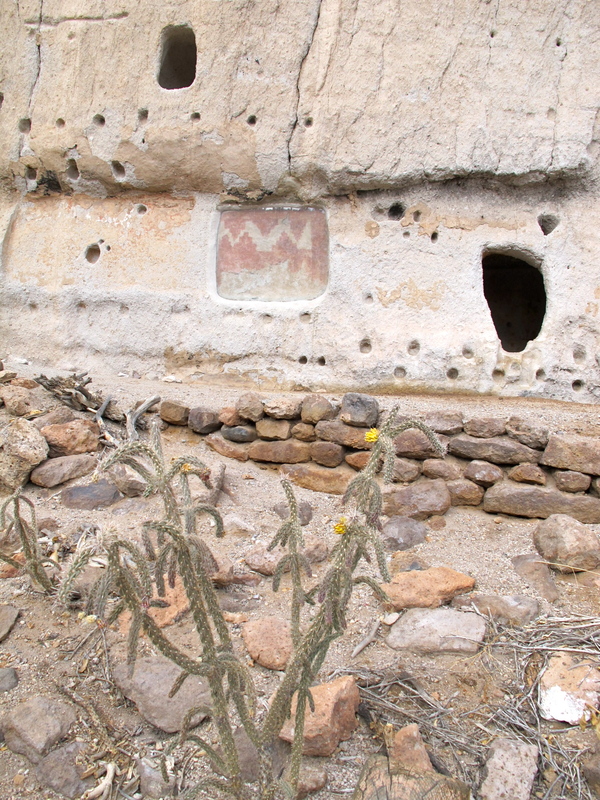 By 1150 hunter-gatherer ancestors of the Pueblo people began to build more permanent settlements. 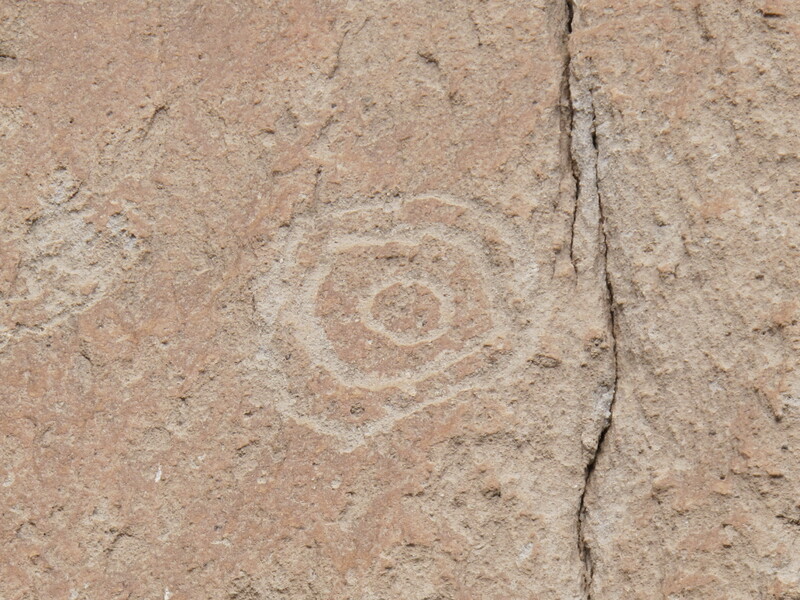 The evidence of these settlements is clearly visible in Frijoles Canyon. 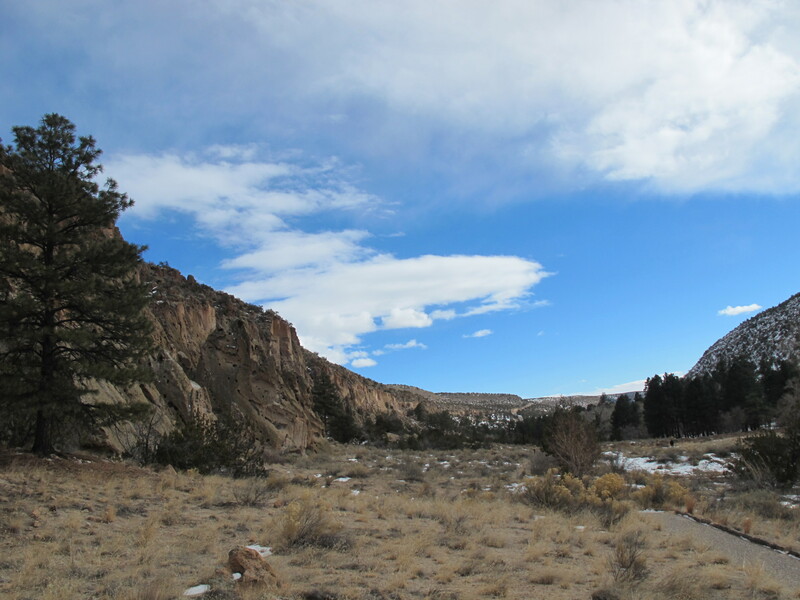 The Main Loop Trail, only 1.2-mile long, takes visitors through this amazing landscape. 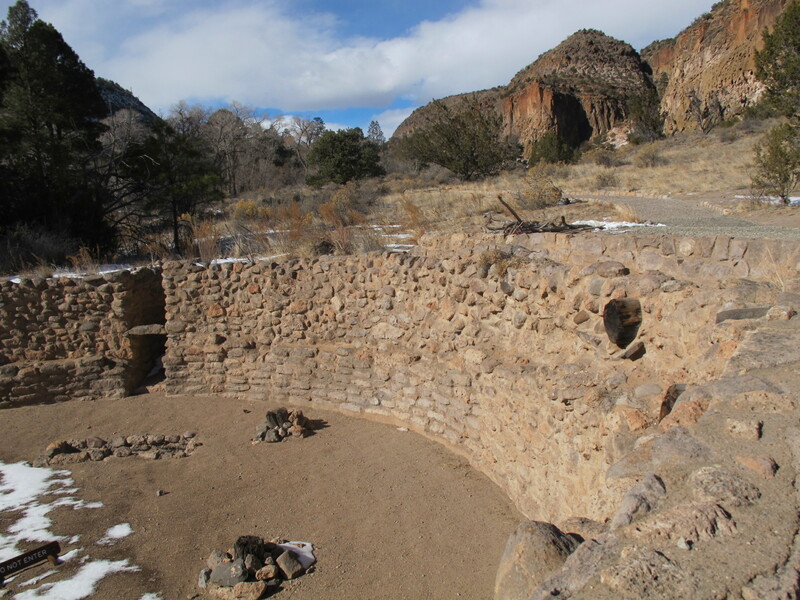 At the bottom of the canyon, near a small stream, are the foundations of a circular Tyuonyi pueblo that once stood one to three stories tall (the visitor center’s museum has a great visualization by the way). 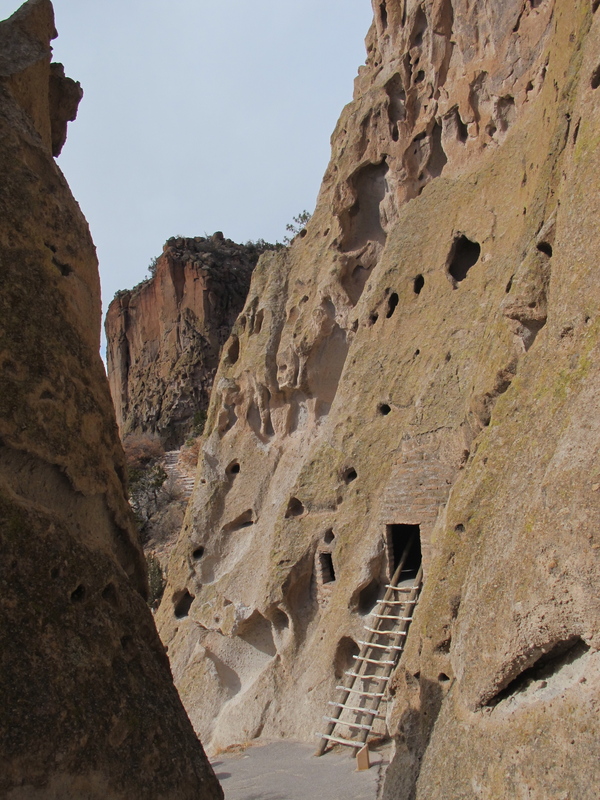 More homes – some of them multistory – are carved in the walls of the sun-warmed wall of the canyon. A reconstructed Talus House gives an idea of what they once looked like, and the rock wall foundations and beam holes extending along the wall testify to how sizable settlement it was. At its peak several hundred people lived here. And then there are cavates, cave rooms dug out of the cliffs. 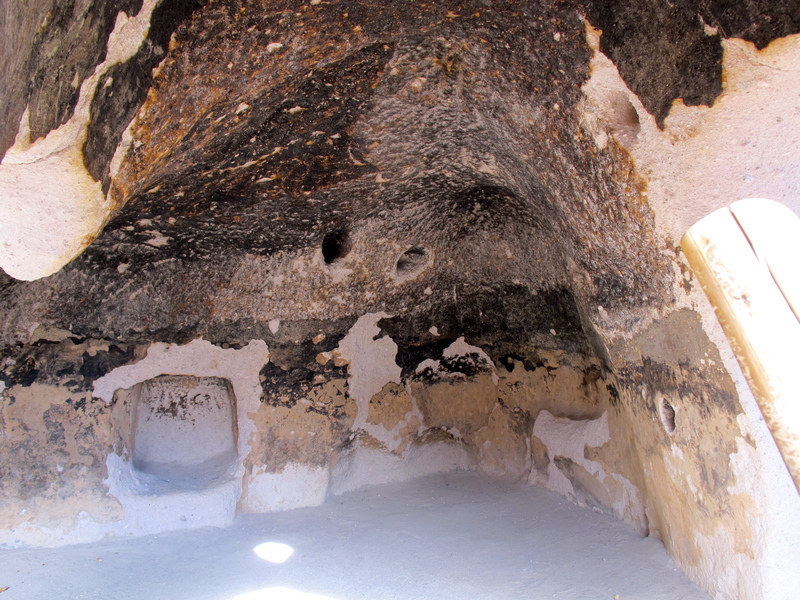 Their lower walls were usually plastered and painted, and the ceilings were smoke-blackened to make the tuff less crumbly. The best part is – you can explore them, climbing up a ladder! The Rito is a beautiful spot. Situated in a direct line not over twenty miles west of Santa Fé, it can still be reached only after a long day’s tedious travel. It is a narrow valley, nowhere broader than half a mile; (…) Its southern rim is formed by the slope of a timbered mesa, and that slope is party overgrown by shrubbery. The northern border constitutes a line of vertical cliffs of yellowish and white pumice, projecting and re-entering like decorations on stage, – now perpendicular and smooth for some distance, now sweeping back in the shape of an arched segment. 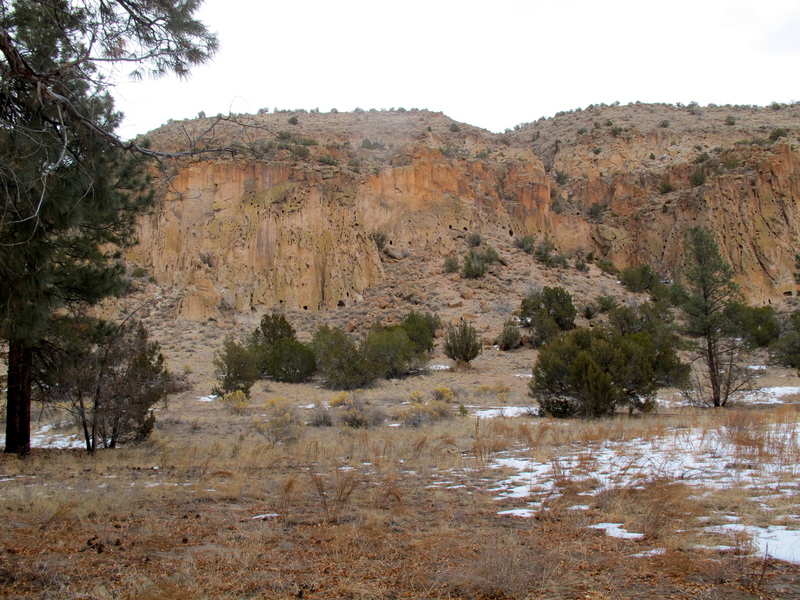 These cliffs vary in height, although nowhere are less than two hundred feet. Their tops rise in huge pillars, in crags and pinnacles. Brushwood and pine timber crown the mesa of which these fantastic projections are but the shaggy border. Through the vale itself rustles the clear and cool brook to which the name of Rito de los Frijoles is applied. It meanders on, hugging the southern slope, partly though open spaces, partly though groves of timber, and again past tall stately pine-trees standing isolated in the valley. Willows, cherry-trees, cottonwoods, and elders form small thickets along its banks. The Rito is a permanent streamlet notwithstanding its small size. 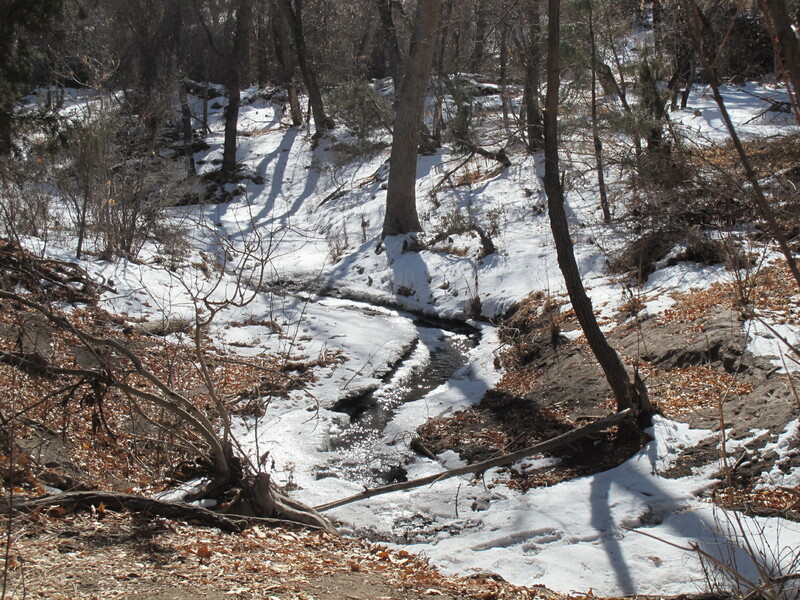 Its water freezes in winter, but it never dries up completely during the summer months. In the cliffs themselves, for a distance of about two miles, numerous caves dug out by the hand of man are visible. Some of these are yet perfect; others have wholly crumbled away except the rear wall. 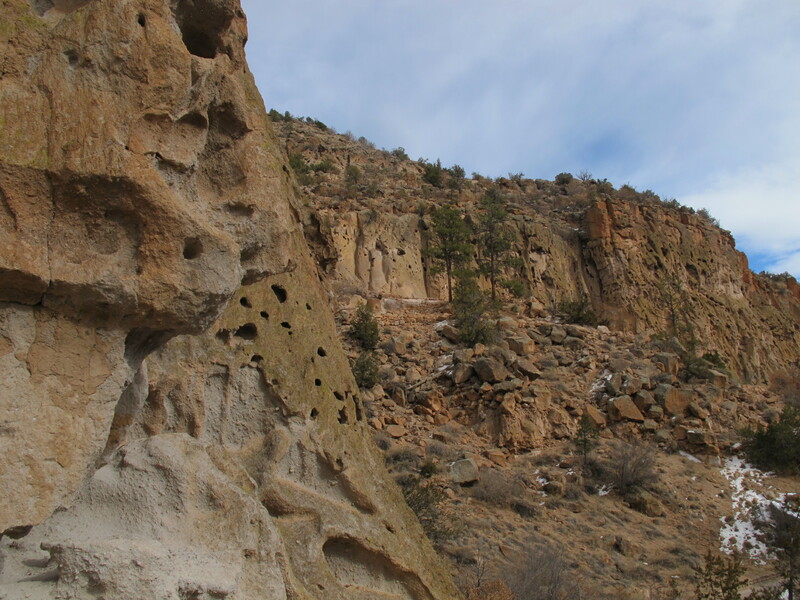 From a distance the port-holes and indentations appear like so many pigeons’ nests in the naked rock. Together with the cavities formed by amygdaloid chambers and crevices caused by erosion, they give the cliffs the appearance of a huge, irregular honeycomb. 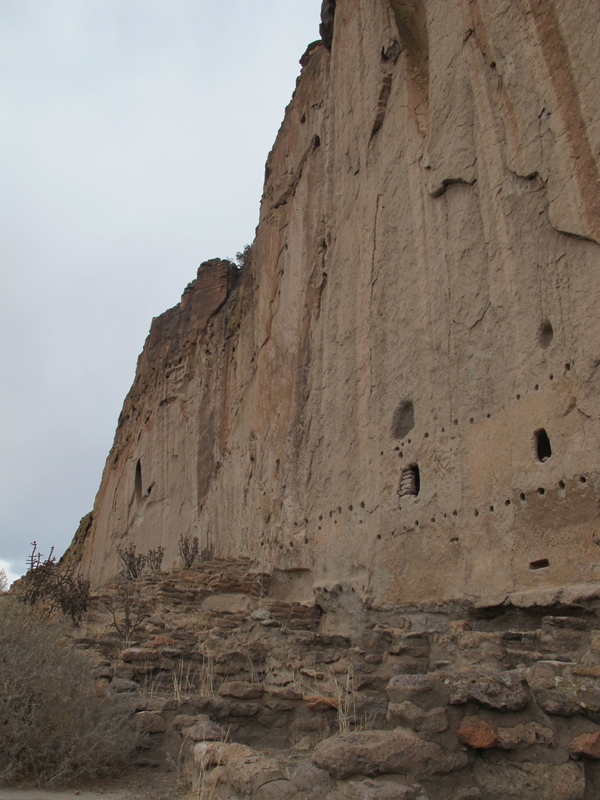 By 1550, for reasons that we don’t fully understand but most likely had to do with drought, the Pueblo people had moved from their cliff dwellings to settlements along the Rio Grande where their descendants live today. They left behind not just the awe-inspiring remnants of their dwellings but also beautiful rock paintings and petroglyphs. Still the Rito must have appeared then much as it appears now, – a quiet, lovely, picturesque retreat, peaceful when basking in the sunlight, wonderfully quiet when the stars sparkled over it, or the moon shed its floods of silver on the cliffs and on the murmuring brook below.